Discount tickets for just $5 using code is COCanada or mentioning the Canada Colorado Association at the door. 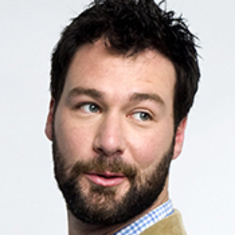 Ottawa-born comedian, host and actor Jon Dore is renowned for his offbeat humor and unique bait-and-switch style. Named by Variety as one of their “Top 10 Comics to Watch,” Dore is a favorite on the comedy club and festival circuit in Canada and the United States. From his humble beginnings as the co-host of the cable talk show Daytime Ottawa and the irreverent roving reporter on Canadian Idol, Dore recently starred in the critically acclaimed ABC-TV series How to Live with Your Parents (for the Rest of Your Life). Dore is the host of HBO Canada’s Funny as Hell and the star of his own award-winning ‘mockumentary’ series, The Jon Dore Television Show. He starred in the stand-up specials Comedy Central Presents...Jon Dore andComedy Now!. Dore has appeared on a number Comedy Central’s specials including Live At Gotham, CC: Stand-Up: The Bonnaroo Experience and Mash Up. He also made guest appearances on How I Met Your Mother andScare Tactics, as well as played the lead role in CBS’s pilot My Life As An Experiment. A regular on late night talk shows, Dore had the honor of being the first stand-up to appear on Conan. Dore's feature film credits include the indie drama Gus and the comedy film Stag.